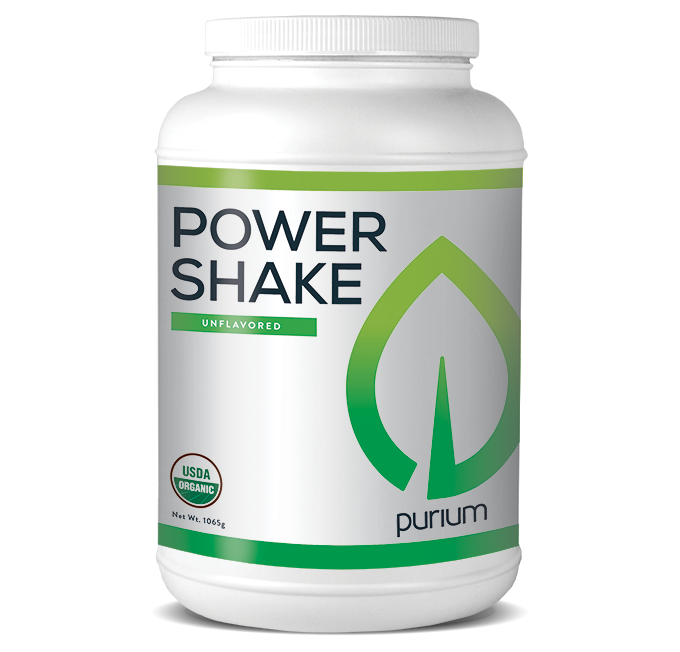 Power Shake is one of Purium’s most popular products, offering several energizing, gluten-free superfoods in one nutritional shake. Power Shake can help support healthy cholesterol, blood glucose levels, digestion and weight loss. It is available in Original (unflavored) and Apple-Berry flavor. Organic Rice Bran Solubles: Rice Bran Solubles is made from the outer, most nutrient-rich and soluble part of brown rice. This ingredient provides a source of vitamin E, tocopherols, tocotreinols, B-vitamins and folic acid. Thanks to its natural properties, Rice Brain Solubles can help support healthy cholesterol and blood glucose levels. Supporting healthy weight, this ingredient also adds a light, nutty flavor that fits perfectly with green drinks. Organic Oats: This flour provides a great source of fiber and manganese, which may support blood glucose levels and the body’s immune system. Organic Spirulina: Spirulina is a cyanobacterium, also known as blue-green algae. This protein-packed marine green is known for being nutrient rich, boasting antioxidant and oxidative properties. Spirulina studies have been tied to supporting endurance, muscle strength and immune function. It is also known as "nature’s multi-vitamin." Organic Carrot Juice: Carrots are recognized as essential superfoods. Their sweet taste complements a variety of green shakes and juices. Their abundance of beta-carotene, minerals and other phytonutrients give them their deep, rich color. Organic Wheatgrass: A popular staple amongst juice bars, wheatgrass provides a wealth of nutrients. The leaves of this plant contain amino acids, vitamins, antioxidants and chlorophyll (a type of green plant pigment), which can help promote weight loss and the body’s immune system. Studies also show that the plant supports healthy blood glucose levels. Organic Millet: This gluten-free grain is rich in fiber and B-complex vitamins. Millet can be easily incorporated in daily dishes and shakes. Some studies suggest millet may support blood sugar levels. Organic Amaranth: This grain has roots in Incan and Mayan civilizations. Containing a great source of fiber and vitamins, amaranth makes a great gluten-free grain substitution. Organic Buckwheat: Buckwheat is naturally gluten-free because it’s not actually related to wheat. Instead, buckwheat is a fruit seed from the rhubarb family and contains a rich source of flavonoids, vitamins and minerals. Flavonoids can help support healthy blood sugar levels. Organic Quinoa: Quinoa is another popular gluten-free grain with a high nutrient-density. It contains more calcium than milk and serves as a great source of protein and fiber. Organic Chia: These tiny black seeds were once a staple in ancient Mayan and Aztec societies. Today, chia remains a rich source of fiber, omega-3 fatty acids, fiber and antioxidants. Organic Alfalfa Leaf Juice: Alfalfa’s roots embed deeply embed themselves into soil, allowing them to absorb trace minerals. Its lightweight proteins and vitamins help stimulate the rebuilding of tissues, encourage the strength of hair, skin and nails, and support circulation. Organic Oat Grass Juice: This cereal grass contains unique proteins and lipids, which can help support the body. The juice can also be a source of vitamins and minerals. Organic Raspberry and Apple Flavor: These natural flavorings are based in acacia gum and have been approved by organic agencies to be used in organic products. The flavorings are made without using synthetic solvents, carrier systems or any artificial preservative. They are not sourced from GMOS or using ionized radiation. Organic Lo Han Berry: Also known as the monk fruit or lo han guo, this extract is nearly 300 times sweeter than sugar. It is in the same family cucumber, squash and melon. Mix two scoops/35.5 g (leveled but not packed down) with 10-20 oz. of cold water or your favorite non-dairy, creamy beverage. Take on an empty stomach 1-4 times per day. Best mixed in a shaker cup or bottle. Power Shake is great prior to, during and after exercise or activity. This product is packed by weight, not volume, settling may occur. In a fast-paced world full of fast food drive-thru and delivery conveniences, it can be a struggle to get your daily nutrition. Power Shake is a convenient way to get phytonutrients from pure, raw superfoods, and stay satiated and energized throughout the day. For this reason, Power Shake has become a Purium staple in 10-Day Transformation and 40-Day Ultimate packs. This product fits well in many weight loss regimens. While there are different nutritional shakes and juices, not many take gluten into account. In the age of consumers who cannot tolerate gluten or simply do not wish to consume it, Purium created a gluten-free formula. With its easily digestive mix and smooth taste, this product is understandably a superfoods powerhouse. Bio Fruit: Helps cover daily fruit servings, since Power Shake covers your greens. Green Spectrum Lemon: Helps boost the green power and alkalinity of the Power Shake. They make a tasty combo, too! Daily Fiber Blend: Supplies 20 grams of rice bran to help trigger the production of adiponectin (“skinny hormone”). This product is gluten-free, vegan and Kosher. Power Shake is certified Organic by QAI. To purchase Power Shake (Apple-Berry flavor), click here. To purchase Power Shake (Original flavor), click here. To purchase Power Shake as part of a 10-Day Transformation, click here. To purchase Power Shake as part of a 40-Day Ultimate, click here.